Black golf towel imprinted with the Butler Grizzly. 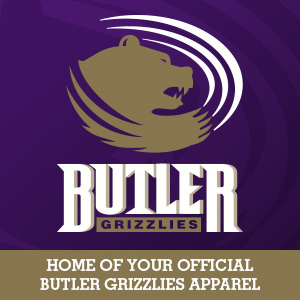 White and purple collegiate pennant "Butler Community College" imprinted in purple at the top, Grizzzly Power head below and "Grizzlies" inset in a purple diamond. Pennant is 24" long and 9 " wide. Stadium pennant "Butler Community College" imprinted in purple along the edge "Grizzlies 1927" imprinted in gold with the Grizzly Powerhead. The football stadium in the background. 24" in length. 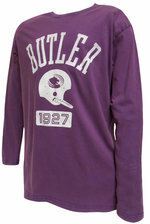 Great way to show your Butler Spirit! Black & grey striped blanket with "Butler Grizzlies" and the Grizzlie Powerhead imprinted on the front center. Blanket is 54" x 84" sweatshirt material. 80% cotton 20% polyester. Very soft & warm. 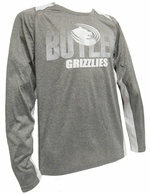 Long sleeve tee shirt, silimar to "Dri Fit", gray body, white on shoulders and under arms, "Butler Grizzlies" and "Grizzly" power head imprinted in white and silver on the upper front. 100% polyester. Clear veiw plastic bottle in either purple or smoke. "Butler Grizzlies" imprinted on one side & the Grizzlie Powerhead imprinted around the top. Bottle is 9" tall & 3" diameter with a white lid and pull out drinking spout. Specify color when ordering.